Inclusions: Fridge, stove, built-in dishwasher, washer, dryer, electric light fixtures, window coverings, ceiling fans, alarm system. Mechanical Upgrades: 200 amps with circuit breakers with no knob & tube. Sloped roofs 03, New hi-efficiency furnace 2005, 2nd bath 2001, professionally finished bsmt., fully waterproofed. Copper plumbing. Hardwood floors on main refinished. Terrific renovated semi-detached home in the desirable High Park/ Bloor West Village neighbourhood. Affordable and spacious on a private south lot with a fully finished basement, 3 bedrooms and two full baths, this sparkling renovated home is ideal for couples, families and first time buyers. 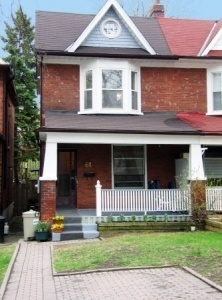 Hillsview is a quiet and winding street in a popular, family-friendly High Park location. One block from Lithuania Park and a very short walk to High Park itself, with is 399 acres of parkland, gardens, picnic grounds, wildlife, and myriad recreational opportunities! Enjoy the public library at the top of Medland Street, and close proximity to superb schools. Less than a 10-minute walk to Keele subway and approximately a 12-minute drive to downtown, with easy access to the Gardiner and the 401, Hillsview is conveniently located within walking distance of Bloor West Village with all its shops, cafes, restaurants & amenities. There is grocery shopping, restaurants and professional services in the much improved Junction area of Dundas Street West, as well as a bevy of choices on Bloor. The main floor of this attractive brick home is open concept with recently refinished hardwood floors and broadloom on the stairs and landing, an ideal space for entertaining or family life. With such polished touches as a cove ceiling and an elegant closed fireplace, the flowing space is very well lit by many windows, some with leaded glass. The bright, updated eat-in chef's kitchen features pot lights, plenty of counter & storage space, and a convenient walk-out to the rear deck and sunny, south facing backyard. Amazingly private garden with a beautiful collection of low-maintenance perennials, fully enclosed by a wooden privacy fence. Skylights on the second level, one in the master bedroom and one in the hall, provide lots of natural light. The master bedroom features a magnificent cathedral ceiling and a bay window, and wall to wall closet space -- storage is no problem here! A second, spacious bedroom features another huge closet and a ceiling fan, while the third boasts a four-piece adjacent bath. Hardwood floors throughout. The high ceilinged professionally renovated basement comes equipped with a modern 3 piece bathroom added in 2001, contemporary potlights and broadloom throughout. A very versatile space, suitable as a recreation room for kids! The remaining third of the basement is currently used as a laundry room/storage area and has excellent potential for a workshop. Other amenities include: legal parking pad at the front of the house, updated mechanicals, many friendly young families on the street.